2016 People’s Liberty grantee Nate May is a composer and pianist whose work is influenced by his Appalachian roots. Inspired by his upbringing, May received a $10,000 grant from People’s Liberty Project Grant II class that allowed him to compose a musical piece entitled "State: A Testimony to Urban Appalachia," which debuted in April at The Sanctuary in Lower Price Hill. 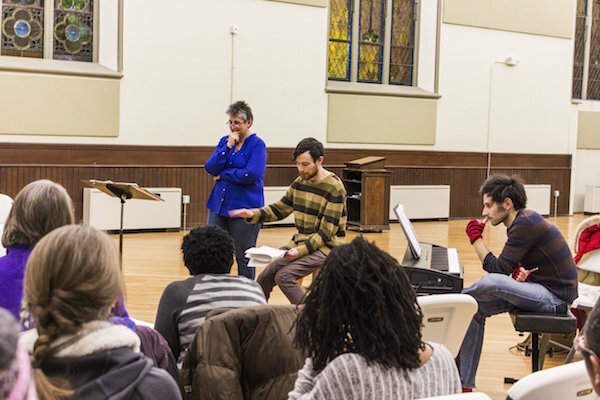 People's Liberty project grantee Nate May (seated), practices his original piece with MUSE: Cincinnati Women's Choir. Though the live performance ran for only two nights, "State" was years in the making. During that time, May wrote an opera called "Dust in the Bottomland," which focused on issues that Appalachians face. That next step came when May was awarded an Appalachian Sound Fellowship from Berea College in 2015. He was funded to collect oral histories, and he planned to use that content as the lyrical text for a piece of music. May then connected with Community Matters in Lower Price Hill, which introduced him to Appalachians living in Cincinnati. As May began to compose State, word spread about the project. May was told that MUSE: Cincinnati Women’s Choir had just moved into The Sanctuary along with Community Matters, and they, too, shared an interest in Appalachian history. May immediately reached out to discuss the possibility of collaborating on the piece, and the choir's director, Rhonda Juliano, enthusiastically took on the challenge. Classically-trained Cincinnati vocalist Kate Wakefield, whom May knew from school, sang the lead part, which tells the story of three urban Appalachian women using their own words. A trio of percussionists and a pianist brought rhythm to the piece. The experience of creating "State" opened many doors for May. He now works as a consultant for the Urban Appalachian Community Coalition, in addition to continuing to compose and perform regularly as a pianist. With the Coalition, May is helping to start an initiative for Appalachian college students in Cincinnati to explore their identities through research, advocacy and cultural events. “On a creative level, having a vision that big, and that prone to failure, and then actually realizing it has given me a big head about the possibilities that I can undertake,” May says. Buoyed by the success of "State," May says that he is now throwing himself into projects with a newfound enthusiasm and self-assurance. May will be speaking about "State," and his other works surrounding Appalachian issues, on Oct. 6 at “Composing Appalachia: A Conversation with Nate May.” The talk is part of a series of literary salons organized by Pauletta Hansel, Cincinnati’s Poet Laureate. The event will take place from 7 to 10 p.m. at Lydia’s on Ludlow in Clifton. A full recording of "State," as well as photos and video, can be found on May’s website.